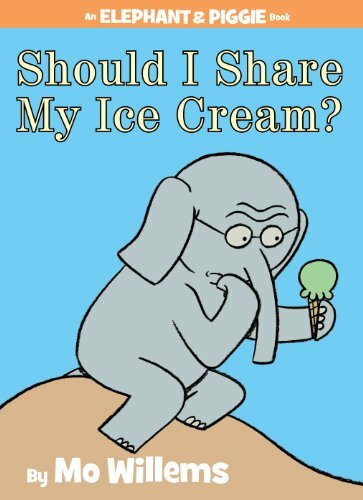 To help usher in warmer weather — which has finally arrived in the northeast — here are two new books by veteran author-illustrators: Geisel Medal–winner Mo Willems’s Should I Share My Ice Cream? 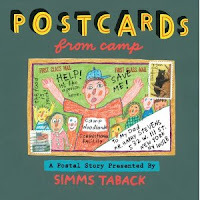 and, for older readers, Postcards from Camp by Simms Taback, recipient of the 2000 Caldecott Medal. Elephant Gerald has a delicious moral dilemma in this latest Elephant & Piggie easy reader (Disney-Hyperion, June). To share or not to share…that is his question. Gerald carefully and thoughtfully weighs the pros and cons of splitting his “awesome, yummy, sweet, super, great, tasty, nice, cool ice cream” with best friend Piggie, but as he’s lost in deliberations, the cool ice cream is steadily melting. By the time Gerald works through his angst, the ice cream is gone and so are Gerald’s hopes of making his friend happy. Luckily, Piggie knows how to cheer Gerald up: “Would you like some of my ice cream?” A familiar problem, a satisfying resolution, and Willems’s friendly illustrations and book design are just what new readers crave. 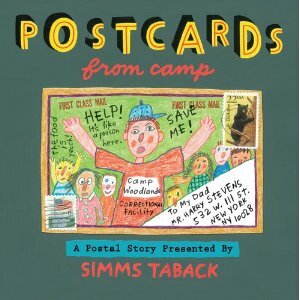 Simms Taback’s epistolary Postcards from Camp (Penguin/Paulsen, June) is something of a Jolly Postman for middle-grade kids. Called a “postal story” on the title page, the book features the correspondence between reluctant camper Michael Stevens and his relentlessly upbeat dad, Harry. The actual story is less compelling than Taback’s detailed collage illustrations, which mostly feature the fronts and backs of postcards purportedly handmade by Michael and Harry (there are also four envelopes with letters to pull out and read). Whether they’re homesick and need a diversion or completely enmeshed in their camp experience, kids will enjoy Taback’s story of one (eventually) happy camper.